Milton Lee Pritchard Snyder, PhD, family history and memoir. with check or money order. Snyder was born in Weippe, ID in 1929, the son of Milton Cooper Snyder and Marie Pritchard Snyder. Grandparents John W. Snyder, Mary Cooper Snyder, and Jessie Lee Jordan Pritchard Snyder all migrated to Idaho from Harmon, West Virginia. Grandfather Walter Icen Pritchard, a United Brethren Methodist minister, remained a West Virginia resident. Wanting future generations to know about their ancestors and origins, Snyder chronicles his early life on the farm and woods, stories about his relatives, and the impact education has had on his life. Snyder moved to Lewiston, ID after the death of his father. After graduation from Lewiston High School, he attended Lewis Clark State College, known then as North Idaho College of Education, B.A. 1951. Service in the Korean War interrupted Milt’s educational plans, but eventually he earned an M.A. in Educ. Admin., 1959, University of Washington, and a Ph.D. in Leadership and Human Behavior, 1973, at United States International Univ., now known as Alliant International Univ., in San Diego. Milt has served as Teacher and Principal at Sunnyside and Richland, Washington, superintendent of schools for Anacortes, Marysville, and Federal Way School Districts in Washington State, Deputy Superintendent of Schools in Oakland, California, and Division Superintendent for Prince William County Schools in Manassas, Virginia. He also served as Deputy Executive Director for the American Association of School Administrators in Arlington, Virginia. He has worked for several educational technology firms as their representative. 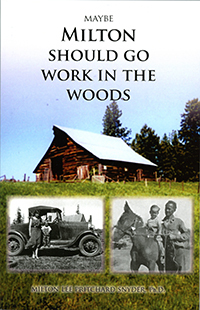 Maybe Milton Should Go Work in the Woods is 347 pages, and contains genealogy charts, photos, and family historical documents. Books by Milton Lee Pritchard Snyder, Ph.D. In 2009 Milton's first book is a memoir and book of the Snyder family history. Click here. In 2015 Milton wrote of his 1973-77 experiences as Division Superintendent of Schools in Prince William County, VA. Click here. In 2016 Milton presented "Radiant: The Dolores Jean Gibbons Story." This third book is a tribute to the educational administrative talents of his wife, Dolores Jean Gibbons, ME.d. Click here. In 2018, Milton brought us an updated memoir that includes his academic and military career. Click here. All rights reserved. Copyright 2019. Return to Homepage.